I had to delay writing this post because I wasn’t exactly sure what all I had eaten on Friday night! I put Steve to work to gather a list of the specifics so I could do the dinner we had with his coworkers justice! As usual, he pulled through – actually bringing me the ticket from dinner that night! Meeting his coworkers for a traditional Southern Indian meal at Karu’s Indian Banana Leaf Restaurant after golfing in Malaysia earlier that morning was a perfect plan! We were hungry, and there was plenty of food! Additionally, the company we kept was awesome. I sat next to an American named Mark, and across from Steve and his coworker (and host for the evening), Lingam. There were four more folks who joined us at the other end of the table: Scott and his lovely wife, Lynn and Mubarak and Bong Tong, who treated us to this fantastic meal! If you haven’t been to this style of Indian restaurant (and I had not been), you sit down at a setting which has a “table” set for you, on a banana leaf. It looks like a place mat, but actually serves as your plate. 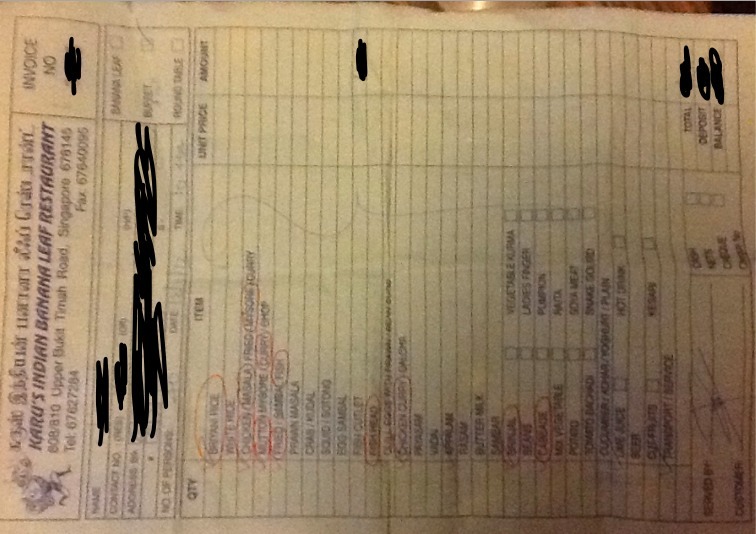 I’m not sure I’ll get the order correct, just trust me that Lingam ordered a great variety of foods, and lots of it! We started off with a few pieces of Papadum, which served as my utensils. Lingam and a few others ate traditionally, by using their fingers to mix and eat their food. I never quite got that comfortable at the dinner table, and therefore managed to walk away with very little curry under my nails! The servers brought Briyani rice, cabbage and Brinjal (eggplant) first. Then, things came more quickly than I could try them! More than once, Lingam laughed at how I was trying to keep up – but was failing miserably to do so! 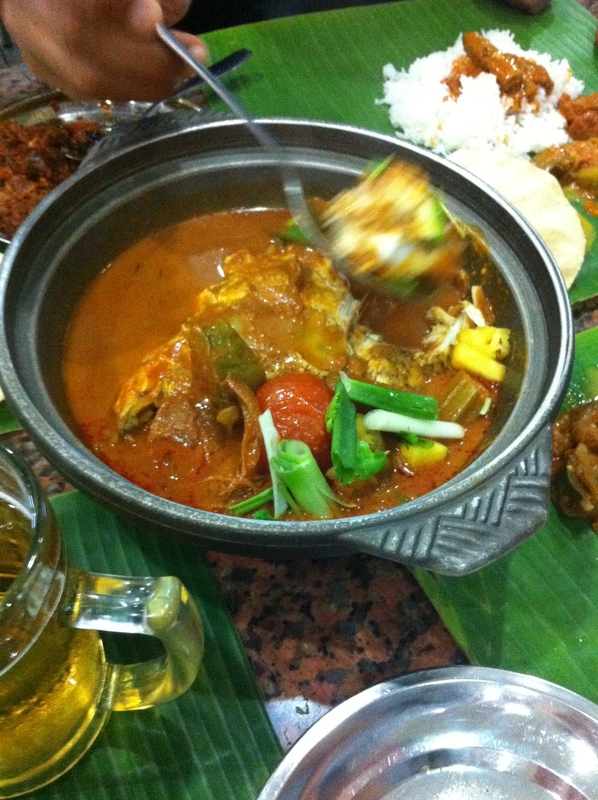 Out came spoonfuls of Chicken Mysore, Mutton Curry, Fried Fish, Chicken Masala, Fishhead Curry and Chicken Curry. I tried it all, and enjoyed it all. There were a variety of flavors, but I was most partial to the Mutton Curry, the Chicken Mysore, the Fishhead Curry, and the Cabbage. We had anticipated going out with one or two of the guys that night, but everyone headed in their own directions. Steve and I headed back to Robertson Quay – figuring we’d have a glass of wine and enjoy the evening outdoors. We immediately ran into two more coworkers of his, chatted, and had several laughs. Everyone I have met thus far has been tremendous! Really fun people! After Bryan and Jason (aforementioned run-ins) left, Steve and I headed back to Wine Connection for that Cab we enjoyed so much earlier in the week. Turns out, we still enjoyed it! Two bottles and a long catch-up conversation later, we retired home to rest up for an outing to Sentosa Island the next day. Yes, we were both exhausted and we got a late start the next day, but I think it was worth having a rare late night out (might have allegedly been an early morning out) in Robertson Quay! 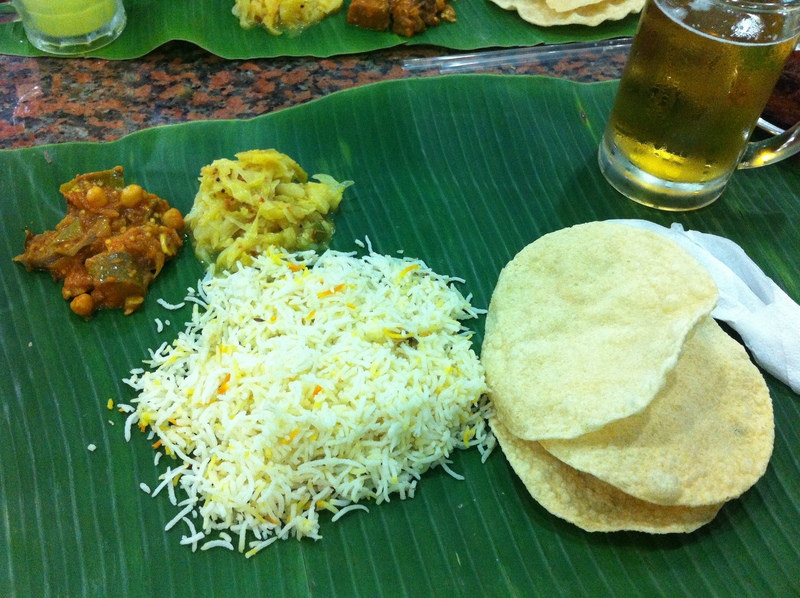 As a parting thought tonight, if you have the chance to try a Banana Leaf Indian meal, I highly recommend it! I thoroughly enjoyed this adventure! I’d love to hear from those of you who have tried this before.